Professor Astronomy's Astronomy Blog: Too Many Planets? From the ground, we can see 1% changes in the light from a star, so lots of transiting Jupiters have been found (68 by today's count, including 5 previously announced by Kepler). But we are not able to detect Earth-sized planets from the ground, at least not Earth-sized planets around sun-like stars. The Kepler data are so much more precise than the ground-based data. This isn't because the ground-based astronomers are sloppy or lazy; it's because the Kepler mission satellite is so good at what it does. From other plots of this Kepler data, astronomers can even see the phases of HAT-P-7b AND see the eclipse of the planet when it goes behind its parent star. 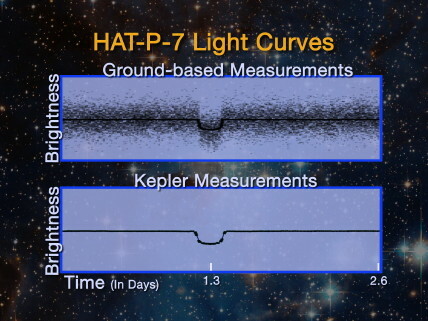 And these data prove that Kepler can see the minute changes in light caused by transiting Earth-sized planets. Anyway, the Kepler mission is finding planets everywhere. Their announcement from a few weeks ago actually mentioned 706 possible planets found so far in those first 43 days of data. Details on 400 of those potential planets were not released yet, but will be in February. However, just because Kepler sees a dip of light that looks like a planet's shadow passing in front of its parent star does not mean that there is a real planet there. There are many other things that can look like planets but are not. For example, if two stars are in orbit around one another and one star passes in front of another, the total amount of light we see will go down. This is called an eclipsing binary star. It is possible to tell normal eclipsing binary stars from planets based on the details of the drop in light, but there are so many stars in Kepler's view that an eclipsing binary may be blended with light from three or four normal and unrelated stars. Kepler can't figure that out on its own, but ground-based telescopes with sharp optics can. Many of the stars in Kepler's sights also have spots, just like the sun has sunspots. A star with a spot usually is rotating, just like the sun does. When a starspot comes in to view, the star gets a little darker. When the starspot goes out of view, the star gets a little brighter. Most stars have many spots, and the spots are always changing (again, just like sunspots). But if a star just has one persistent spot, and especially if that star is blended with other stars from Kepler's point of view, it can look like a planet. What this means is that many of the 706 potential planets Kepler has found may not be real. Ground-based telescopes can help tell if the planets are real or not. But the amount of ground-based telescope time it would take to confirm all 706 planets is tremendous. Even if all astronomers stopped looking at everything else, it may not be possible to check all 706 planets. And that is from just 43 days of looking! Kepler's job is to find Earth-sized planets in earth-like orbits around sun-like stars. We want to know how common planets that might be able to host life are, and as the Earth is the only planet where we are sure there is life, it seems logical to start looking for life by looking at planets as similar to the Earth as we can get. As I said above, finding Earth-sized planets is harder than finding Jupiter-sized planets. This also means that proving Earth-sized planets are real, and not one some other weird astronomical phenomenon, is also very hard, and will require every second of follow-up observing time on ground-based telescopes that the Kepler team can get. So this is why Kepler has announced so many potential planets without proving that each one is real. The planets they announced two weeks ago are, for the most part, big planets. They're planets the size of Jupiter and Neptune, not planets the size of Earth. There is a lot of science that can be done with these big planets, but finding life is probably not one of them. So, rather than using their precious telescope time proving all of these big planets, the Kepler team is saving their time for the interesting planets. Like the 400 that they found but didn't announce. Or like possible Earth-sized planets that we haven't heard a word about yet. Finding Earth-sized planets in Earth-sized orbits will take time, at least three years. Why? Because you need at least three transits to prove that there is something regular going on. The first transit is a possible discovery, the second transit gives you a possible orbital period, which predicts the third transit. If the third transit happens on time, then you can be positive that what you see is real and occurs regularly. If Kepler were looking at the sun from far off in space, the Earth would transit once every 365.256 days (approximately) -- once a year. So it would take three years to see three transits of the Earth. Kepler has been working for just over one year, so we have at least two years to wait for Earth-sized planets in Earth-sized orbits around sun-like stars. In the meantime, we should be getting close to hearing about Earth-sized planets in very short orbits around their stars, if they exist. These would be planets made of molten rock that would make Mercury seem frigid. Any of these hellish Earths would have made at least three transits by now. Again, the problem is ruling out all the other possible explanations. The Kepler team also announced a handful of stars with multiple transiting planets. And, in addition to planets, there's a lot of other work that can be done with Kepler data. Starspots and eclipsing binaries come to mind. So does asteroseismology. Plus there are other weird objects that Kepler is finding and/or studying. And there is a raging debate among astronomers about the Kepler team not announcing all of their planets and releasing data slower than they promised. I'll talk about those another day.